Copyright 2008, Marianne Stowell Bracke, Sainath Chinnaswamy, and Elizabeth Kline. Used with permission. This article explores the different steps involved in adopting a new service model at the University of Arizona Science-Engineering Library. In a time of shrinking budgets and changing user behavior the library was forced to rethink it reference services to be cost effective and provide quality service at the same time. The new model required consolidating different service points, i.e., circulation desk, photocopy desk, and reference desk into one central location to be staffed by library associates. First we performed a financial analysis and determined the cost per hour of the existing staffing model. This was followed by logging questions at different service points to understand the type of questions asked at different locations. This data-drive approach also uses a robust referral system where complex reference questions are referred to individual subject librarians. We performed Action Gap Surveys to measure customer satisfaction levels before and after we employed the model. The article also emphasizes the training and continued education required for library associates to provide quality reference services. A confluence of changing user behaviors, a changing budget situation and efforts throughout the University of Arizona (UA) Libraries to realign its services with strategic priorities drove the UA Science-Engineering Library to engage in a process of restructuring its service model. The library was facing several budget cuts in the recent past and it became a priority to use existing resources effectively while maintaining the same level of quality reference service expected by customers. Although the primary customer base of the Science-Engineering Library has steadily increased over the past several years due to an increase in science and engineering undergraduate and graduate students, the number of librarians serving this customer base has decreased because of budget cuts. The original model – consistent with traditional services in many academic libraries – included three service points (reference, circulation, and photocopy) where staff delivered a suite of distinct services. Staff at these sites spent a significant amount of time redirecting customers to another desk either because customers lacked the ability or patience to distinguish between service points. The end result was often confusion and frustration by the redirected customers. It became clear that the existing model was no longer effective and thus warranted a change in approach which yielded cost savings and maintained the same level of customer satisfaction. For many years, the UA Science-Engineering Library employed a service model similar to many other libraries. There were several simultaneously staffed service desks: circulation and photocopy desks were staffed by paraprofessionals and students while the reference desk was staffed by librarians. Reference librarians were also available to answer in-depth questions by referral or appointment. These desks had various configurations over time, but at the beginning of the project both the geography and staffing of service areas were problematic. All public service areas were on the ground floor of the building. Immediately inside the front door were reference and circulation desks in very close proximity to one another. The photocopy desk was in the process of being closed due to cost considerations. There was also an expansive information commons, as well as a reference collection adjacent to the reference desk. The information commons initially contained approximately 40 computers, a number that was nearly doubled after a reduction of the reference collection that cleared additional space to expand the commons. The reference desk was staffed for 65 hours per week by reference librarians from the Science-Engineering Team (SET), and the circulation desk was staffed by paraprofessional members of the Materials Access Team (MAT) whenever the library was open (approximately 100 hours/week during the regular academic semester). Although reference questions were supposed to be answered only at the reference desk, the circulation desk staff frequently fielded reference questions at times when the reference desk was unstaffed. The MAT staff has a strong customer service ethic, so they would attempt to answer any questions they received. They were limited in their ability to answer these questions since they were not provided with reference training. At the time, students and MAT staff only received training in circulation functions and very basic use of the catalog since it was assumed that they would not provide reference assistance. Complicating matters, the geographic proximity of the desks resulted in a situation where users entering the library were faced with two desks. Despite signs, it caused confusion about the functions of each desk. This model was called into question when a project team, Finding Information in a New Landscape (FINL), was created to look at information and referral services holistically across the UA Library system. FINL used a broad definition of information and referral services, and included any point at which library customers might receive assistance. Although individual services had been analyzed, the complete set of services was never examined systematically across libraries. For example, virtual reference and level of service provided at some of the service desks were analyzed in the years leading up to FINL. The larger picture of how these various services integrated into a system of reference provision, however, was not examined. At the same time, both human and financial resources were becoming increasingly limited. Reference librarians were asked to do new types of work such as grant-writing, fund raising, and deepening faculty partnerships, in addition to their traditional responsibilities. Circulation numbers were decreasing and traditional MAT work such as checking out books and reserves items were declining due to an increase in self-checkout machines, open reserve shelves, and electronic reserves. As a result of FINL's analysis, there were many changes to service delivery in the Main Library, as described elsewhere (Bracke et al. 2007). Because of the geographic proximity of the service desks, a different model for structuring services was chosen in the Science-Engineering Library. The approach to developing this model was data-driven and was particularly influenced by several points of analysis. First, the salaries of everyone providing an information service at a desk (students, MAT staff, and librarians) were examined to determine the cost per hour of the current staffing model. These calculations took into account hours spent off the desk in training. Only circulation and reference desks at the Science-Engineering Library were examined in this analysis, as it had already been determined at this point by the library administration to close the photocopy desk. Second, questions were logged for a week at a time on three separate occasions throughout the year. During these periods every question asked at the service desks was transcribed. In this, it was requested that staff record the actual question that was answered, which was not necessarily the question as it was first posed. Additionally, time required to answer the question was noted. Subsequent analysis of these logs allowed length and types of transactions to be better understood. Logs were analyzed after the data collection period by individuals who were very familiar with the work performed at the Science-Engineering Library's desks. Question logs were coded by type of question (e.g., directional, technical, reference, circulation, and campus) and the type of skills needed to answer each question based on the training provided to employees in the old service model (e.g., student, trained generalist, subject expert). 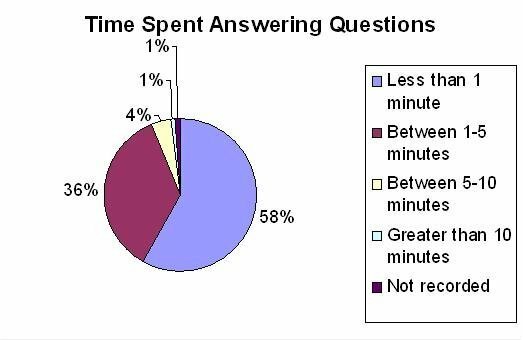 A total of 691 questions over the three collection periods were recorded, out of which 58% of the questions were answered in less than 1 minute, 36% of the questions required between 1-5 minutes, and 4% of the questions required between 5-10 minutes (Chart 1). 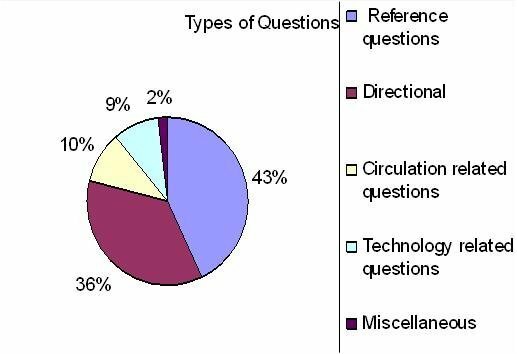 Looking at the types of questions asked, reference questions constituted 43%, directional questions accounted for 36%, circulation questions accounted for 10% and technology-related questions accounted for 9% (Chart 2). Questions were also analyzed based on the level of knowledge and training that would be required to answer them. 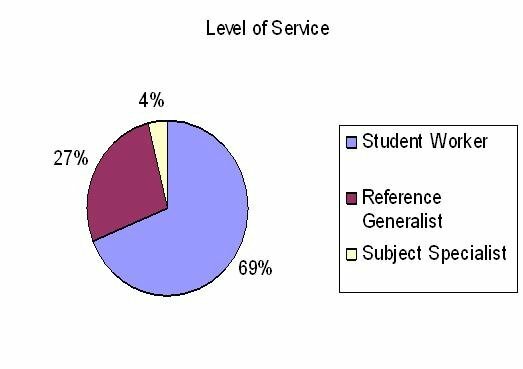 FINL found that 69% of the questions could be answered by a student employee, 27% could be answered by generalists (individuals trained to provide general reference services) and only 4% of the questions required subject specific reference expertise (Chart 3). Analysis of question logs provided a sense of what staffing levels were necessary to provide existing services, but did not provide insight into what services ought to be offered. In order to gain a user-driven perspective on what services should be offered in a new reference model, FINL also conducted two rounds of Action-Gap surveys (Cravenho & Sandvig 2003) at the Science-Engineering Library. Action-Gap surveys allowed FINL to compare the library's performance on approximately 20 aspects of its desk service with the services most valued by library users. The survey presented a list of services offered, and asked users to identify the five most important services, the five best services, and the five services most needing improvement. Two different versions of the survey were used for the circulation desk and reference desk, reflecting different aspects of service at each desk (In Appendix A the survey administered at the reference desk is presented). It was clear that providing reference under the old model was extremely expensive, and question logs made it clear that the majority of questions could be answered by a trained generalist or a student. In other words, most questions were not reference queries that required a subject expert librarian. Additionally, the surveys showed that customers were placing little value on traditional types of reference service. For example, an item that ranked both most important and most in need of improvement by survey respondents was "Help finding a computer when it is busy." All of these data points indicated that the current service model in the Science-Engineering Library was expensive and confusing for users, and that it needed re-examination. The new model replaced the two pre-existing desks within the Science-Engineering Library with a single all-purpose desk, staffed by a MAT staff member any time the library was open. Additionally, there would always be at least one student worker at all times. It was determined that having at least two individuals at the desk was necessary because of the challenges involved in staffing a large, busy information commons in the area with numerous technology or computer related questions. It was also important to have two individuals at the desk in order to ensure that the security gates could be observed even when one staff member was assisting a user in a distant part of the area. It was later discovered that even with two people the desk was understaffed because of the large physical area and diversity of user needs. As a result, an additional student was provided by the Main Library's photocopy department for many of the hours, with the provision that they be allowed to do scanning for document delivery and interlibrary loan during down times. A new desk that served the work functions for three service sites was purchased and placed near the entrance. This newly constructed one-stop service point was intended to reduce confusion for customers and eliminate wasted time redirecting customers. Similar to Flanagan and Horowitz (2000) observations, the decision to position the desk in a prominent location was intended to help motivate customers to stop and get assistance. FINL realized that MAT staff, which had only been expected to provide circulation services in the past, could provide front-line service with proper training. Moreover, by taking librarians off the desk, some of their time would be freed to take on new responsibilities and allow them to pursue activities in which their expertise could be most valued. This would mean that timely and appropriate referrals to subject-specialists would become even more important. In studying the whole reference system, one of FINL's most significant findings was that referrals were not well understood. In other words, there was no data describing where referrals came from or what users did after they were referred to a subject-specialist from the desk. For example, prior practice entailed a reference provider handing out the business card of an appropriate subject specialist and expecting the customer to contact the librarian. Although librarian business cards were freely distributed at many desks, there were not commensurate numbers of in-depth questions actually being asked. FINL realized that the onus was set on the customer and recommended more efficient, customer-friendly practices be put in place. Close attention to the "hand-off" process was also emphasized by Flanagan and Horowitz (2000). At the same time, by putting individuals with more limited in-depth knowledge on the desk it was essential to improve the referral system. The preferred reference model was, and continues to be, to have the reference provider answer the customers' question and complete the reference transaction at the time the customer comes to the library for assistance. Unfortunately, this is not always a very efficient use of resources. In the new model, if the reference provider cannot answer the question, they are encouraged to call other desks or the subject specialist directly, a process called "desk support". Depending on various factors, including inability to connect with another reference provider or complexity of the question, at this point the reference provider may make an automated referral to the subject specialist. An online form, filled out by the reference provider at the desk, was developed to remove the barriers for the customer in getting assistance. There are several advantages in this streamlined process as the tasks that constitute referrals, origination, follow-through, and resolution of customer queries, are easily handled in a virtual environment. The form, set to include information about the type of customer, subject area, question being asked, and the best way to contact the customer, was programmed to be sent as an e-mail to the appropriate subject specialist. Librarians could easily locate referrals in their e-mail as all are in an easily identifiable format. They contain a standard subject line, with the phrase "Referral' preceding the subject matter of the question (e.g., Referral: Molecular & Cell Biology). Since a trained reference provider fills out the form, she or he includes a succinct description of the question, the types of resources used, and the customer is not inconvenienced further. It was apparent that it would be necessary to engage in significant training activities in order to implement the new model. In particular, MAT staff would be required to provide types of service in which they had never been trained. FINL recommended that SET form a Reference Training Group to address the training issues that would be specific to the changes that would occur in the Science-Engineering Library. This group was required to develop a comprehensive training and support plan to cover the areas and disciplines served by SET. This group identified which training modules needed to be included and how to test and assess learning outcomes. To help in the identification process, the training group re-examined the previously collected question logs to assess customer needs and analyze trends among questions that were asked at the desk. The training group also consulted with individual librarians to assess customer needs based on their past experiences on the reference desk. 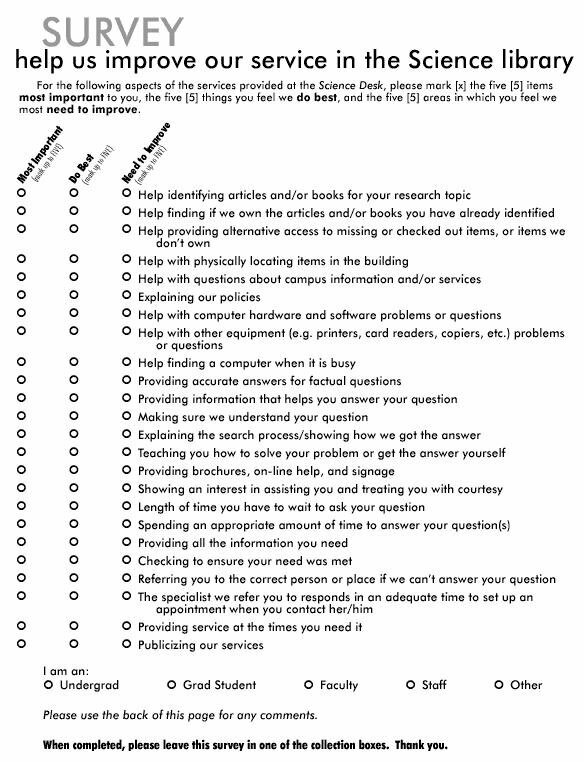 These data gathering tasks are identical to approaches cited in other studies (Peterson & Kajiwara 1999; Tucker 2004). A curriculum consisting of a series of training modules was developed by conducting a qualitative analysis of question logs used in the earlier cost analysis. A significant number of questions were straightforward reference questions pertaining to finding specific citations in books and journals. Question logs also indicated several questions related to Chemistry and software issues in using the SciFinder Scholar database. Interviews with librarians indicated questions asked by community users pertaining to patents, technical reports and standards. Based on analysis and feedback, the Reference Training Group decided to organize eight training modules which included: General Science Reference I (covering finding journals and using indexes), General Science Reference II (covering finding books, dissertations, and e-books, in-depth interlibrary loan usages and reference policies), Physical Sciences I (Astronomy, Planetary Science, Atmospheric Sciences, and Geosciences, Physical Sciences II (Physics, Computer Science, Mathematics, and Optics, Life Sciences, Chemistry , Special Formats (Patents and Technical Reports) and Engineering (including Standards). Each of these modules included indexes, databases and general reference sources. The modules were spread over a period of six weeks to ensure that MAT staff members had enough time to familiarize themselves with the content in individual modules. Each module was assigned to one member of the reference training group. It was their responsibility to contact an SET subject specialist that would determine the content and provide training. All modules were required to have specific outcomes, outline of activities, measurable assessments, and interactive activities such as role playing, group problem solving, and hands-on practice (Appendix B). Modules were developed keeping in mind that new personnel would have to be trained from time to time because of the turnover of staff members. All modules included a general overview of the resources, a brief overview about the different departments using the resources, and the types of research needs generally encountered by users in those departments. The group's overall objective was to train MAT staff members to answer general reference questions and to recognize when to refer the more complicated questions to subject specialist using the online referral system. After every module staff members were asked to take a quiz which served as a measure of their understanding of the different resources that were introduced in training. In most cases, questions asked on quizzes were real questions adapted from question logs. In addition to subject-specific modules, a separate session was assigned to illustrate the importance of the reference interview. This module was adapted from an existing module created by the Undergraduate Services Team (UST) that was used to train all librarians and staff that worked at the Main Library's reference desk. Highlights included tips on how to conduct a reference interview and the importance of asking specific questions to uncover what customers really wanted. Staff members were required to complete additional training modules offered by UST in the Main Library. These were more generic modules and covered topics such as hardware troubleshooting, CD burning, scanning, software training (e.g., Photoshop and Dreamweaver), general reference resources, locating things physically in the Libraries, and customer services skills. In all, there were 16 modules and staff members had about 12 weeks to complete all modules. It was decided that training modules would not be sufficient to train MAT staff to provide reference services. As a result, several mechanisms were put in place to help serve as evaluative measures. During the same time period of their reference training, MAT staff members were required to shadow any of the SET librarians at the desk. This provided MAT staff members an opportunity to ask questions and learn from reference interactions. MAT staff members were required to shadow between eight and ten hours a week for a period of two months. Once the training was completed, each MAT staff member was required to select one of any of the SET librarians as a member of their annual developmental review team, an advisory group designed to provide feedback to each member of the library's staff. In that, the librarian would evaluate the individual's performance at the reference desk two to three times per semester, as well as act as coach helping them to develop the necessary competencies to staff the desk. This enabled librarians to provide feedback and to ensure that questions were answered correctly and appropriate referrals were made. This was successful, as it was received well by both MAT staff and SET librarians. It also helped to break down barriers between librarians and staff. A critical aspect contributing to the success of the training program was continuous communication between the training group and MAT staff members. Feedback/check-in sessions were held every month to discuss issues and share new ideas learned. For some areas MAT staff members requested additional training to become more familiar with library resources. The training group also tried, with more limited success, to provide ongoing training. Examples included sending weekly e-mails containing an actual reference question and encouraging individuals to share strategies for answering the question. These activities were not judged to be very successful, as participation was very low. Explanation for the low participation included time constraints, levels of personal comfort in answering questions in a public forum in front of peers, and the fact that these were not required activities. In addition, MAT staff members were encouraged to attend vendor demonstrations to become familiar with new resources. After their initial training phase, MAT staff members were assessed once every six months by their work team supervisor. The assessments are based on quality and completeness of the reference interview, appropriate referrals, and effective use of information resources. This assessment also covered general circulation tasks that MAT staff members were expected to know, such as checking books out, updating patron records, placing holds, etc. The reference assessment checklist used by the supervisor is listed in Appendix C.
A final, and critical part of evaluation, was determining whether the new model was effective. Did it achieve the goal of providing an adequate level of service at a lower cost, and did it allow higher-paid librarians to be redeployed to other projects? Additional action-gap surveys were administered after the new model was implemented, and the results indicated that library users had a nearly identical perception of services in the Science-Engineering Library as had been the case under the old model. Additionally, nearly 150 in-depth questions were answered by subject specialist librarians after referral from the Science-Engineering Library reference desk in the first year of the model, demonstrating that librarians were brought into the process as appropriate. (It should be noted that these referral numbers did not include in-depth reference queries where a subject specialist was contacted directly by a user.) Taking into account user satisfaction and use patterns, as well as the much lower staff costs, the new model achieved its first goal. Subject specialists were able to become more involved in new strategic projects and were able to devote more time to existing projects, as a result of their transition off the desk. The implementation of a new reference model at the UA Science-Engineering Library was driven by the need to make better use of the limited human resources, an experience that is likely relevant to a wide-range of libraries facing changing user behaviors and expectations, and stretched financial resources. There is also information learned from the project that will be of interest to other libraries contemplating such a change. First, an unanticipated benefit of the project was that it provided library staff with training that they should have had in the past. It had always been assumed that library support staff would not need reference training, since they officially did not provide that service. The reality of the situation was these staff members had always provided reference service. This may have been because no reference librarians were present, or because the line between circulation or directional questions and reference questions may be fuzzy at times. Whatever the case, staff members had been providing reference service for years and should have had training earlier. Second, training is a critical investment of time and resources and can be considered to be one of the most important tenets of any organization besides recruitment. It also influences the vitality and success of an organization. As stated by Tucker (2004) "training programs help promote an environment of staff development and success". If prepared, implemented, and maintained consciously, staff will be able to grow and succeed in their new work. Training programs are only part of the formula; the other is personal involvement and commitment. When asked what they do to improve their reference desk skills/training, staff reported engaging in several activities including: looking at different databases to familiarize themselves with the search features, go through vendor tutorials, review subject guide pages created by librarians, and discussions with librarians. A few also reported that they followed up with subject specialists in cases when they could not answer a reference question and had to make a referral. These self-enforced initiatives were valuable components of this new model because they provided MAT staff with confidence and experience to answer reference questions they receive at the desk. These types of self-paced activities are great approaches for any institution to incorporate continuous learning since they can be done at any pace and any-time. Subject guides are great resources that can provide informal, cost-effective, and ongoing training for this constituent group. It becomes also critical for subject specialists to make sure that new reference tools, such as databases or upcoming database features, are explained to staff. Most MAT staff reported that they predominantly answer directional or technology related questions. A common mind-set among the respondents was that with the lack of reference questions asked at the desk, they often forgot what they learned in training and thus had a slightly harder time answering questions than if they had a frequent stream of questions where they could solidify their training. In line with this, they also desired periodic homework or refresher training. The latter was also expressed as ideal by public service staff (Mozenter et al. 2003). The concept of refresher training brings about a dilemma for both trainers and trainees. How can a library develop a training plan that will efficiently prepare staff to take on reference desk duties, while at the same time, allowing them to develop as reference providers in light of continuing declining trends at reference desks? Until libraries can find an answer to that question, perhaps the occasional practice question supplied by subject librarians can help with reinforcing and continuous training. Removing reference librarians from the reference desk meant that they had to work harder at remaining connected to users. Eliminating one type of patron contact, however, did not mean that subject specialists had no user contact. In-depth reference questions brought to them through referral or through direct contacts were one source of continuing contact, and it was also incumbent on them to seek other opportunities for contact through instruction sessions, faculty collaborations, or other means. Removing subject specialists from the desk also made it more important for them to communicate their knowledge to library staff. For example, it was more important than ever for desk staff to be notified when a class had an assignment that might result in dozens of students coming to the desk with similar questions. Likewise, any trends noticed by desk staff had to be communicated to the librarians. One staff member noted that she observed customers carrying numerous journals to the photocopier and that these individuals would have benefited from knowing about a new electronic delivery of in-house journal articles to their desktop. Lack of knowledge of library services is not something unique to the UA Libraries. Regardless of the advance and continual notices sent by librarians to customers about library services and resources, many still remain unaware of library support that is available for their educational, teaching, or research activities. It is not so much about the lack of knowledge of library services that is at issue here it is the concept of a continuous feedback loop that has to be ingrained in library staff. Upon reflection, there are some things that the training team would do differently. One example is ensuring that freed-up librarian time is really dedicated to new work. The re-allocation of librarians' time to new work was not directly tracked. It is very easy for librarians to fall into the trap of having existing work expand into the available time and not initiate new work. Additionally, the training team would have preferred to spread the training out over a longer period of time. This would have given MAT staff members more time to absorb the material in the modules and to gain deeper skills and confidence through more hours spent shadowing librarians at the reference desk. A good training program should also be flexible and able to incorporate feedback from trainees. Some suggestions for changes in the training program offered by MAT staff included: an organized informational binder left on site that one can easily retrieve when needed or review at their convenience, more time spent on practical training, more periodic refreshers, and continued reference desk observation by a SET librarian at various times during the year. Overall the transition to the new service model has been successful given customer reactions and the re-allocation of librarians' time. The success can be attributed to the high standards of customer service set by MAT staff members, the training program, and the referral system which has been very effective in facilitating responses to complex references queries. The new model complements the budgetary limitations and has helped reference librarians take up additional tasks and responsibilities in serving primary customers. Bracke, M. S., et al. 2007. Finding information in a new landscape: developing new service and staffing models for mediated information services. College & Research Libraries. In press. Cravenho, J., & Sandvig, B. 2003. Survey for action, not satisfaction. Quality Progress, 36 (3): 63-68. Flanagan, P, & Horowitz, L.R. 2000. Exploring new service models: can consolidating public service points improve response to customer needs? The Journal of Academic Librarianship 26 (5): 329-338. Mozenter, F., Sanders, B.T., & Bellamy, C. 2003. Cross-training public service staff in the electronic age: I have to learn to do what?! The Journal of Academic Librarianship 29 (6): 399-404. Peterson, C. & Kajiwara, S. 1999. Scientific literacy skills for non-science librarians: bootstrap training. Issues in Science and Technology Librarianship. 24. [Online]. Available: http://www.istl.org/99-fall/article3.html. [December 11, 2006]. Tucker, J. C. 2004. Getting down to business: library staff training. Reference Services Review 32 (3): 293-301. Looking up library items, reserves, holds, articles, etc.